Bordered by Jiangsu to the northeast, Zhejiang to the southeast, Jiangxi to the south, and both Hubei and Henan to the West, , landlocked Anhui spans a total of 139,000 square kilometers, about 8,000 square kilometers larger than the size of Greece. It is one of China’s smallest provinces. The province of Anhui was created only during the Qing Dynasty when, in 1666, the government separated Anhui from Jiangsu and joined the flat plain north of the Yangtze with the mountainous terrain of the south. Anhui’s northern livelihood has often been dependent on the Yellow River. During the 1850s, because of accumulated loess-silt and poor dike maintenance, the Yellow River broke loose of its levees, changing course. The course shift had devastating consequences for northern Anhui farmers and resulted in subsequent peasant rebellions including the 1850-64 Taiping Rebellion. Yellow River’s waters ravaged Anhui again in 1938 when the Chinese broke the levees purposely in an attempt to stop the Japanese during the 1937-45 Sino-Japanese War. 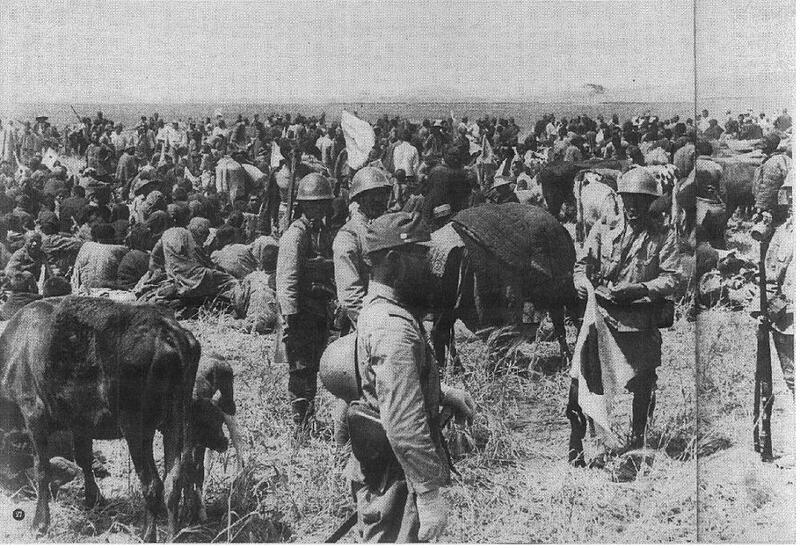 The resulting flooding innudated vast areas of Anhui and ultimately resulted in the death of 900,000 Chinese while doing little to halt the Japanese advance into China. Anhui has a population of over 60.5 million people, roughly the same as Italy. Han make up more than 99% of the total population. Up until the 7th century CE, the Hakka minority group flourished in the area, but as Han migration into Anhui increased, the Hakka moved further south into Fujian and Guangdong. Anhui’s largest minority ethnic group today is the Hui, followed by the Man and the Zhuang. 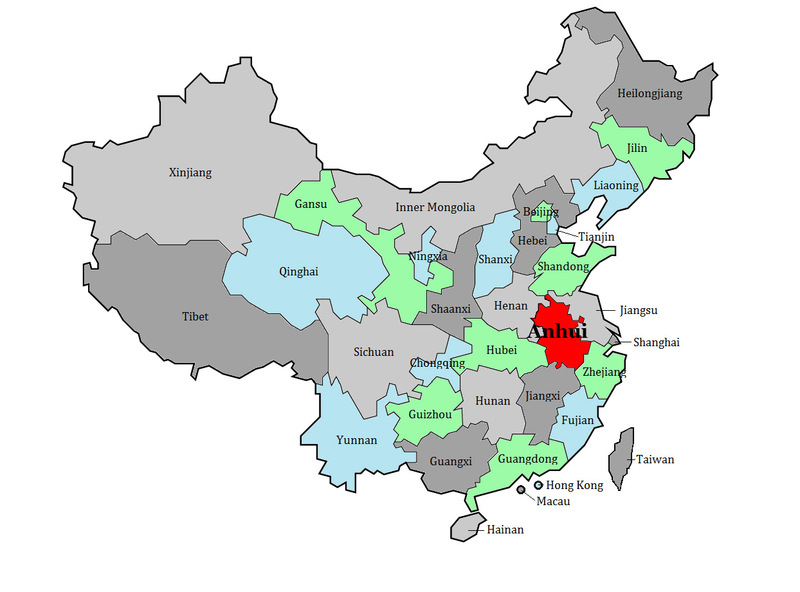 Anhui has an annual GDP of around $339 billion US dollars, roughly equal to that of Israel, with a GDP per capita of over $5000. Before the 1950s, Anhui was poor and economically backward. Agriculture, the mainstay of its economy, had low yields due to poor irrigation. 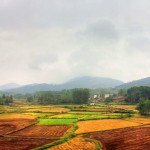 Agricultural advances since the 1950s have meant that the south now produces two crops of rice a year; in the north, better irrigation along with improved fertilization has increased wheat, soybean, barley, and cotton yields. The south also grows vegetables, oilseeds, fibers, tobacco, mulberry trees for silk worms and tea. 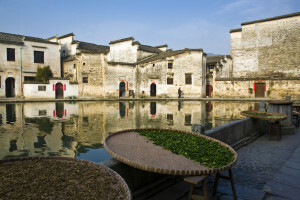 Anhui has been known for its tea since the 7th century, especially its Keemun (Qimen) black tea. Anhui also raises pigs, and some sheep, and takes fish from its abundant lakes and rivers. Aquaculture is practiced along the Yangtze. Anhui is an important coal and steel producing region. It also has strong power, metallurgies (metallic compounds), chemicals, chemical fertilizers, machinery and machine tools industries. It also manufactures textiles, electronics, building materials, agricultural machinery and is a significant food-processing centre. Northern Anhui is very flat, mostly covered by the North China Plain, one of the largest alluvial plains in China, spanning several different provinces. This area acts as a drainage basin for the Huai River and its tributaries, which travels down from the northwest to Anhui’s eastern border where it reaches Hongze Lake just over the Anhui/Jiangsu province line. Historically, northern Anhui has been highly prone to flooding. Because of this, the Huai River was the one of the first targeted to undergo significant water management after the founding of the People’s Republic of China’s in 1949. Its water management system includes dams on the upper reaches of the Huai and its tributaries, as well as hundreds of miles of dikes and irrigation and drainage canals. Several west-east mountain ranges separate the northern plain from southern Anhui. These ranges include the Dabie Mountains—an eastern extension of the Qin range, and the Baiji and Huang mountains which traverse south of the Yangtze. The Huang Mountains, reaching a height of 1,800 meters, are a favorite of poets and artists because of their distinctive shapes and abundant vegetation. They are also popular with tourists. The Huayang Mountains which run northeast from the Dabie range to Hongze Lake divide the Huai and Yangtze river basins. All these mountain ranges make southern Anhui much hillier compared with the flat plain of the north. The Yangtze plain is dotted with lakes which merge with the river during floods, increasing the width of the river to as much as 8 km in some places. 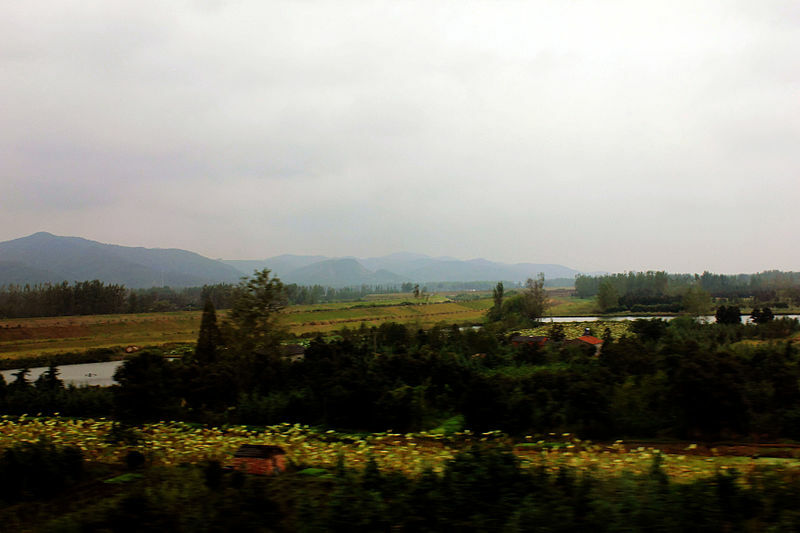 Anhui’s main sights lie in the south. A good place to start is the town of Tunxi or Huangshan. Although offering few sights of interest except for souvenir-lined Lao Jie or Old Street at the end of which is the Wancuilou Museum displaying a collection of private antiques, the town makes a good base for trips to Huangshan (Yellow Mountain) and the Huizhou villages. The Huangshan’s granite peaks come in distinctive shapes and are blanketed with pines. As it can rain as many as 200 days on top of the mountains, the peaks are often enshrouded in mist. The peaks offer many excellent hikes. 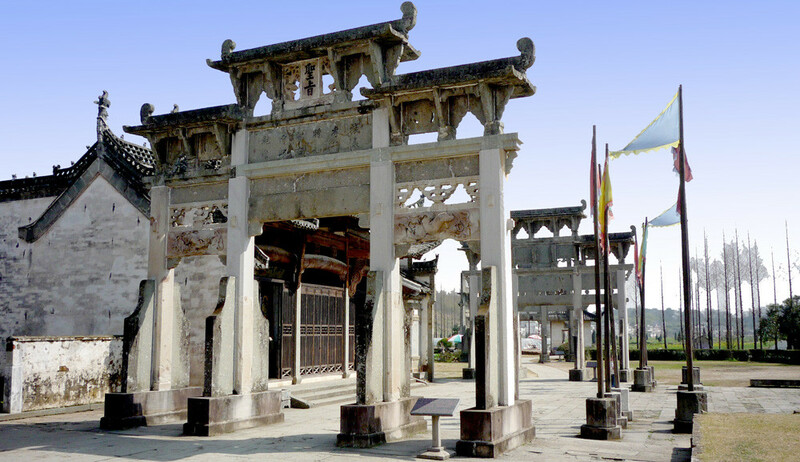 Also around Tunxi are Anhui’s distinctive Huizhou villages built from money sent home by merchants selling tea, lumber and salt throughout the Chinese empire during the Ming and Qing Dynasties. These often lavish merchant homes are frequently nestled in forests of pine and bamboo. 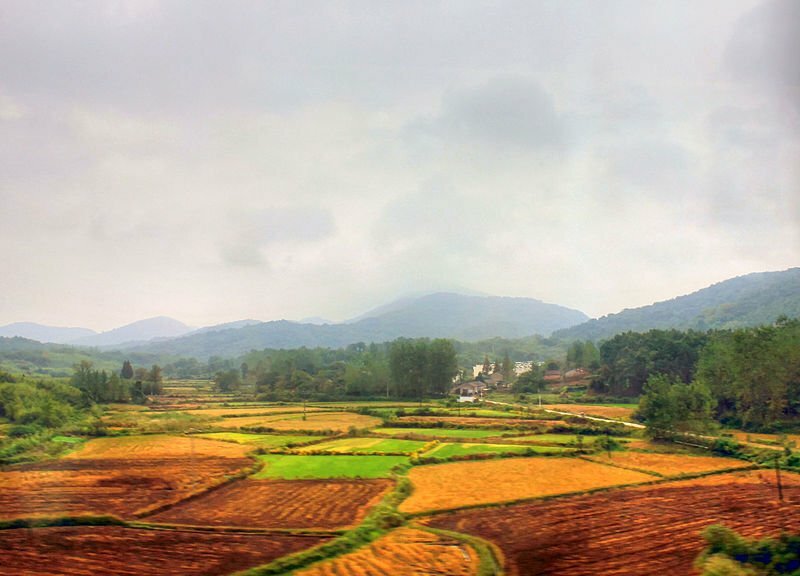 Two of the most picturesque of these villages are Xidi and Hongcun. Other villages of note include Tachuan, Nanping, Guanlu, Chengkan, Tangmo, Shexian and Yuliang. Much of the architecture of these villages is defined by white washed walls roofed with dark tiles; also characteristic are decorative arches, high windows and carved wooden screens. Also around Tunxi is Qiyun Mountain, revered by Daoists who still tend the shrines housed in caves cut into its sides. The mountain has good trails traversing it. Further north of Tunxi is Jiuhua Mountain, believed by Buddhists to be the home of the Bodhisattva Dizang, Lord of the Underworld, when he spends time on Earth. The mountain is often enshrined in mist giving it an unreal feel. It is a pilgrimage spot for devout Buddhists who come to pray for the deceased or visit its many temples. Although lacking in sights, Hefei, which is Anhui’s capital, has good markets, parks and lakes and makes a good place from which to further explore the province.